The truth is, if there’s a needle involved, it might hurt a little, you will feel something. I am often asked ‘Do Botox injections hurt?’ The key to this, as with any injection, is to try to relax (easier for some than others, I know). Often it’s the anxiety of having a new experience which makes us ‘feel’ more pain. You know what they say ‘Forewarned is forearmed’. Do your research. ask lots of questions and have a good chat during your consultation. Get to know (and make sure you like/trust) your medical professional and ensure you know exactly what will happen during the procedure. We (us ladies) can of course feel more pain at certain times of the month or if we (all of us) are stressed, tired or more sensitive than usual. 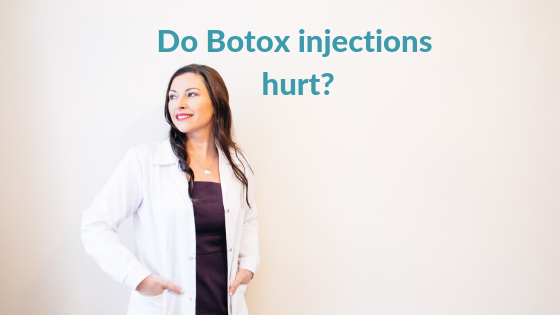 Botox injections really shouldn’t hurt too much, however, as mentioned above, when introducing a needle into the skin you are bound to feel something. I use the finest of needles (tiny insulin ones) when giving Botox injections to ensure it is as comfortable as possible. During your procedure you will have just a few little injections, it is over very quickly. Honesty is vital here – the first time you have Botox injections, it might sting a little. All my clients tell me that it is virtually pain-free and some even quite enjoy it! Another truth, which a lot of injectors keep quiet about, is the possibility of bruising. Now, it’s unlikely that you’ll get a bruise at the injection site, but, again…If there is a needle involved there is always a risk of bruising. I am yet to meet any Botox injector who hasn’t bruised someone. So, if you do get a tiny bruise (Don’t panic!) it may feel slightly tender, it can be easily covered with concealer and it will disappear after a few days. If you have any questions about the above, please do get in touch, alternatively book in for a consultation with me and we can discuss if Botox is suitable for you or not.